All transactions are safe and secure with a reliable history in online purchasing behind each of our associates. Buy the Seinfeld Spectacular t-shirt to own Seinfeld clothing and merchandise. Jerry's girlfriend Sidra (Teri Hatcher) delivers this classic Seinfeld quote during one of the most memorable episodes of the Seinfeld television series. During the episode, Jerry grows concerned that Sidra has implants. He recruits Elaine to investigate the matter by "accidentally" touching Sidra's chest in the sauna. 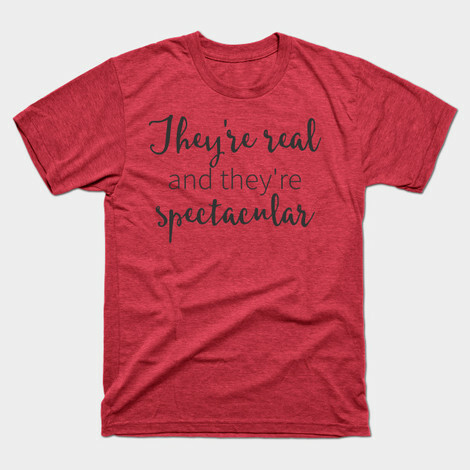 Sidra eventually realizes that Jerry is responsible, and as she storms out of his apartment she delivers the quote on this Seinfeld t-shirt, "They're real and they're spectacular." In addition to the Seinfeld Spectacular tee above, browse the Seinfeld Clothing Gallery for more apparel like men's and women's clothes, kids shirts or hoodies.